Every purchase is an opportunity to earn travel rewards — and to boost your loyalty account balances, it’s important to maximize your return on each dollar. Today, TPG Contributor Richard Kerr explains how you can rack up points and miles at the grocery store with credit card bonuses and more. The average American household will spend between $150-300 each week on groceries. If you’re at the high end of that range, you’ll spend upwards of $15,500 annually at the supermarket. That’s a large chunk of spending, and with the right approach, it can earn you an equally large chunk of points and miles. Today, I’ll carry on from last week’s Guide to Maximizing Gas Purchases and look at the different tools you can use to maximize every dollar of your spending at the grocery store. 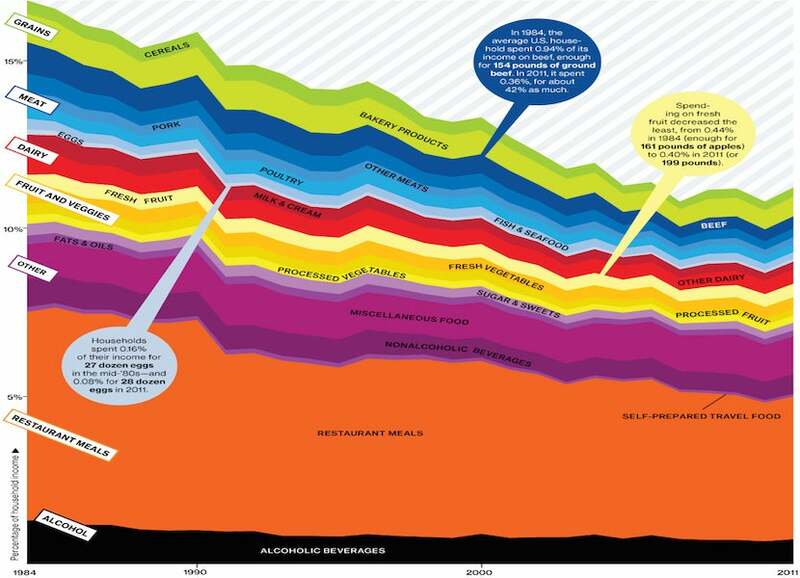 The USDA, US Bureau of Labor Statistics, and Businessweek worked together to create a stellar graph demonstrating how Americans spend money on food. As you can see below, the average American household spends roughly 6% of post-tax income at the grocery store. Do a quick calculation in your head of how much money that means in your particular situation. With that amount in mind, let’s look at some starting points for making the most of your grocery store spending. Average American spending on food as a percentage of income. Graphic by Bloomberg Businessweek. 1. Know the limits of your particular rewards, both in terms of earning and redeeming. For example, some credit cards bonuses are capped, like the $1,500 quarterly limit for 5% bonus categories on the Chase Freedom card. As another example, Safeway’s Gas Rewards program usually only allows you to redeem up to 10 rewards at a time (for a total discount of $1 per gallon). Being aware of these limits will help you decide which rewards are most useful to you. 2. The merchant category code determines whether a particular purchase will earn you bonus points. If you’re uncertain how a given merchant is coded, I recommend testing it with a small purchase. You can then examine your card statement to see whether the merchant in question codes properly. For example, grocery purchases at Walmart and Target are not categorized as groceries on some rewards credit cards. 3. Don’t override common sense and the bottom line of your grocery bill. If shopping at Walmart for groceries saves you a significant amount of money over your local grocery chain, then you might be better off sticking with those savings and not bothering with a credit card that offers a bonus for grocery purchases. Do the math and make sure that you’re not paying more than you should to earn rewards. Several cards offer fantastic bonus earning rates for grocery spending. Image courtesy of Shutterstock. This card gives you three Membership Rewards points per dollar spent on up to $6,000 of grocery purchases each year, and one point per dollar beyond that. Additionally, if you hit 30 transactions per month on the Everyday Preferred card, you get a 50% bonus on all points earned, so you could effectively earn 4.5 points per dollar. Membership Rewards are worth 2 cents apiece in TPG’s June valuations. If your family spends $15,000 annually at grocery stores and you hit the monthly bonus, you could earn 40,000 points each year just on purchases at US supermarkets, worth $800. The card has a $95 annual fee, so your net value earned could be in the neighborhood of $700. This card has no annual fee, but you only earn two points per dollar spent at US supermarkets (again, on up to $6,000 in spending annually). Also, the transaction bonus is 20% instead of 50%, but requires only 20 transactions per month instead of 30. This card offers 6% cash back on the first $6,000 in purchases at US supermarkets annually, and 1% on all purchases thereafter. The 6% return on the first $6,000 would earn you $360 cash back. The annual fee for the card is $95. I would only recommend this card if you’re topped out on Membership Rewards points that you can use in the foreseeable future, or if you’ve already maxed out the bonuses on other cards. This card earns five Hilton HHonors points per dollar spent at US supermarkets. The problem is that Hilton HHonors points are only worth about one half cent apiece. I would only recommend this card if you’re a die-hard Hilton fan or if you often stay at the brand’s properties for work-related travel. This card usually includes grocery stores as one of its rotating quarterly bonus categories, and 2015 is no exception. This quarterly bonus was available January through March, earning a solid 5 points per dollar (though it’s capped at $1,500 in purchases). Even if you’re not likely to spend that amount on groceries, don’t forget the large gift card racks now located in most grocery stores (with many third-party merchants) that can help you maximize the bonus. Chase Freedom offered 5x points on groceries in the first quarter of 2015. This card earns only 1 Ultimate Rewards point per dollar on grocery store purchases. However, Ink Plus can do much better. Take advantage of the 5 points per dollar this card earns at office-supply stores (on up $50,000 of spending annually) to purchase grocery-store gift cards. Not many brands are represented, but Staples (for example) sells Whole Foods gift cards, and you may find others. Target often isn’t coded as a grocery store, but you can still save a substantial amount on groceries there. Shopping with the co-branded REDcard debit or credit card will take an additional 5% off your bill anytime you use the card in-store or online at Target.com. The U.S. Bank Flexperks Visa can earn 2 Flexpoints per dollar on groceries. This card earns 2 FlexPoints per dollar in the category you spend the most on (gas, groceries or airline) and most cell phone expenses during each billing cycle. FlexPoints are redeemable for airline tickets at a maximum rate of 2 cents per point. One attractive feature of the FlexPerks program is that awards count as revenue tickets, so you earn frequent flyer miles when you redeem your FlexPoints, and that boosts the overall value slightly. Many grocery store chains offer fuel discounts in conjunction with any purchases you complete at the store. What’s nice is that some chains offer bonus fuel points or discounts on gift card purchases (excluding MasterCard/Visa/Amex gift cards and a few others). This makes for a great double dip opportunity when you use your rewards credit card to buy the grocery store’s own gift cards, and then buy your actual groceries and pay with the gift card you just bought, earning fuel points two times. This doesn’t work at every chain, as some chains won’t allow you to earn fuel points on their own gift cards. I recommend completing a small trial run first to see whether you earn fuel rewards twice. Kroger — Kroger Fuel points are awarded at 1 point per $1 spent in store. Every 100 points equals 10 cents off a gallon of gas, up to $1 off per gallon of gas. You earn 2 points per dollar on gift card purchases, and you can redeem your points not only at Kroger fuel pumps, but also at designated Shell stations. Now through August 2nd, earn 2x points on all purchases made on Friday, Saturday or Sunday. If you buy the right items, BI-LO fuel perks can add up quickly. BI-LO — BI-LO Fuelperks is one of the more involved programs out there, but it can provide great savings. For every $50 you spend, you earn 5 cents off per gallon of gas for up to 20 gallons. 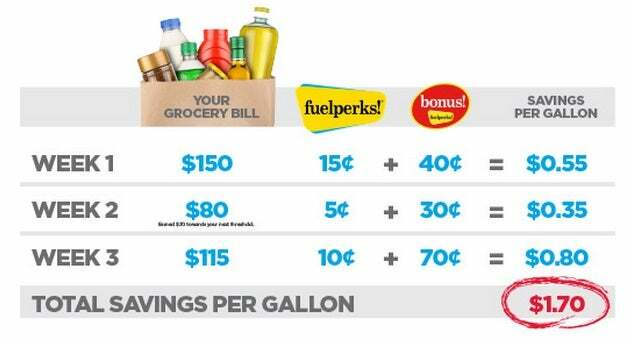 In addition, BI-LO labels many grocery items as Bonus Fuelperks Items, which can earn an additional 3-15 cents off per gallon. Double points are often awarded on gift card purchases, with the usual exclusions for MasterCard, Visa and Amex. Redemptions are not capped like they are at Kroger, allowing you to earn enough points for completely free gas. Safeway — Safeway’s Gas Rewards program is essentially the same as the one offered by Kroger. Earn 10 cents off a gallon for every $100 spent, with redemptions capped at $1 off per gallon of gas. 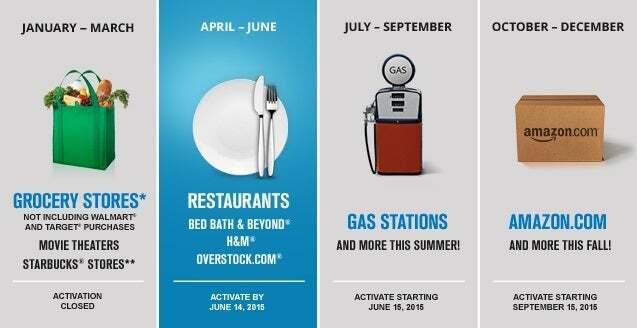 You only have 1 month to use points from when they are earned, and you can redeem points at Safeway gas stations, or at participating Texaco and Chevron locations. You can earn 2 points per dollar on all eligible gift card purchases, and Safeway sometimes runs promotions that offer 4 points per dollar. Winn-Dixie — This program is similar to BI-LO Fuelperks, and like Kroger’s program, you can redeem your points at Shell stations. Bonus items award an extra 3-50 cents off a gallon of gas. Interestingly, some liquor purchases award the highest fuel discounts, giving the unfortunate impression that the program subsidizes your driving the more you drink. Earning discounted gas on top of credit card points is a no-brainer if you have a local supermarket that allows you to double-dip in this manner. I find that applying your best “social engineering” skills and becoming chummy with a few regular cashiers is a tactic that yields large returns. Fraud is an ever-increasing concern in the gift card world, and you don’t want to give a supermarket the idea that you’re doing anything shady. Of course, any strategy you have for points and miles should be goal-specific. Points are a terrible long-term investment and should not be hoarded. Regardless of which strategy you use to maximize your grocery purchases, it’s best to have a flight or hotel redemption in mind for the points or miles you’re earning. To help keep track of your spending at grocery stores on particular cards, check out the TPG To Go app (available from the Apple Store and Google Play). If you want more personalized feedback on how to boost your rewards in general, check out the TPG Maximizer, which helps you weigh your options and recommends the best credit card for you based on your spending habits and travel interests. What are your strategies for maximizing grocery purchases?